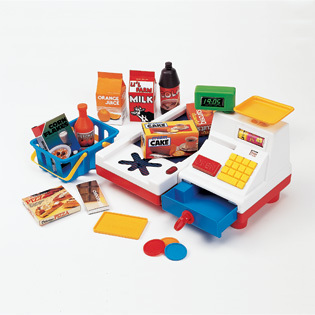 When I was about 4 or 5 years old, I distinctly remember owning a plastic cash register with a moving belt attached. I'm pretty sure it was this exact toy, but with different food. 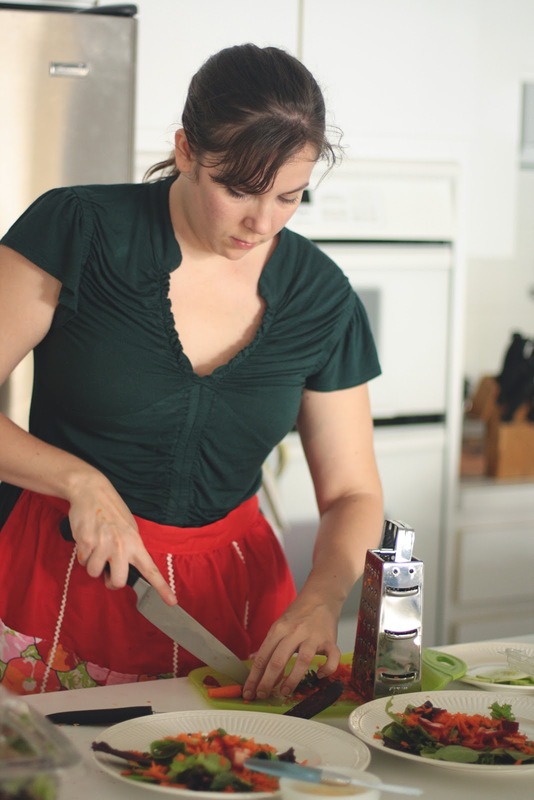 I would spend hours ringing up grocery items, and then even longer laying everything out 'just so' for pretend cooking. I watched PBS cooking shows and had visions of being a very young Julia Child (yes, I even impersonated her voice). I arranged my plastic pans and food just like I saw on tv and chatted to my imaginary audience about the wonderful culinary dishes I was creating. Things aren't much different now. 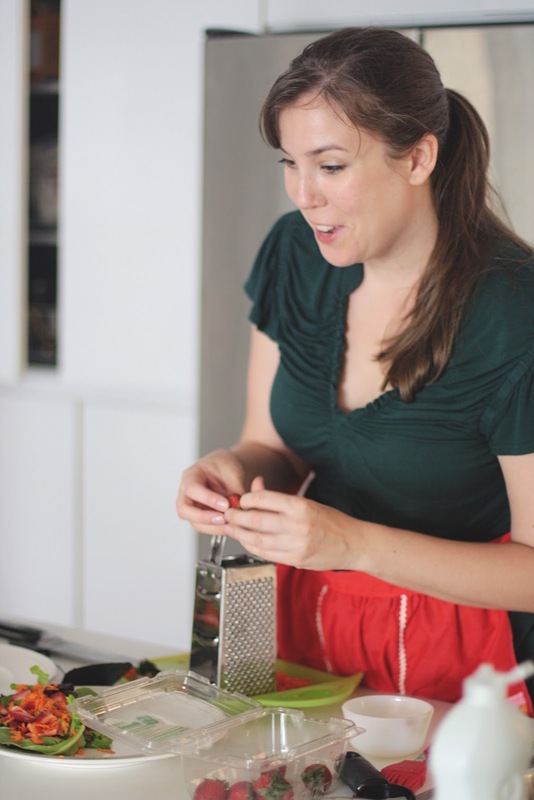 I love to buy groceries, I love preparing food, and I still break out my Julia voice now and then. I was just thinking last night that one of the many nice things about living with my parents for the past year is that I have more people to cook for (and we can take turns cooking!). I bought the new Food Network magazine from the checkout line the other day (why oh why don't I just subscribe when I end up buying EVERY issue??). I love that every recipe has big colorful pictures to go with it. I never understood why Cook's magazine was all black and white photos and illustrations. Gross. Anyway, I came across a recipe for hoison burgers with sriracha mayo and decided to give it a try for dinner. Slicing strawerries. The grater was for carrot. There's something I really dislike about grating carrots. I have the same feeling towards greasing pans when baking. It really doesn't take much effort, it's just annoying to me. But grated carrots are so much better than big pieces of chopped carrot in a salad. Dinner! Oven fries, hoison burger with sliced cucumber, sautéed scallions, and sriracha mayo, and mixed greens with bell pepper, carrot, strawberries, and pomegranate vinaigrette. Food Network magazine is one of my favorite magazines that I subscribe to. Another good food magazine is Martha Stewart's Everyday Food. Just came across your Etsy shop and then blog. Love your work. My son has a small cash register set along with play food. He absolutely loves this little gadget. More-so he's the best scanner ever at the grocery store and now wants to cook dinner (real dinner). The meal you prepared looks great. I will have to take a gander at the Food Networks Magazine - really soon.